evangelizing the (digital) natives : "When Will We Use This?" - Can STUDENTS Find The Answer? "When Will We Use This?" - Can STUDENTS Find The Answer? I have a notion that math teachers get this question more than anyone else. I don't notice a cultural aversion to reading and writing (and even science) that I feel toward math. I want to answer that question, but more often than not, I just don't have an answer for things like adding rational expressions with polynomials in the numerator and denominator (if YOU do, please share.) I feel like our textbook writers would even say the same - our rational equation and radical equation chapters are a little sparse on the practical application. Many of the things Algebra curriculum still has students doing by hand is done by computer or technology in the "real-world." Unless I've worked in 6 different applied science fields before moving to education, my exposure to "real" applications will be limited to problems posed in college or that I've encountered in our textbooks. The irony of the solution to this problem, is that I think we can direct our own experiences to help students answer this question. 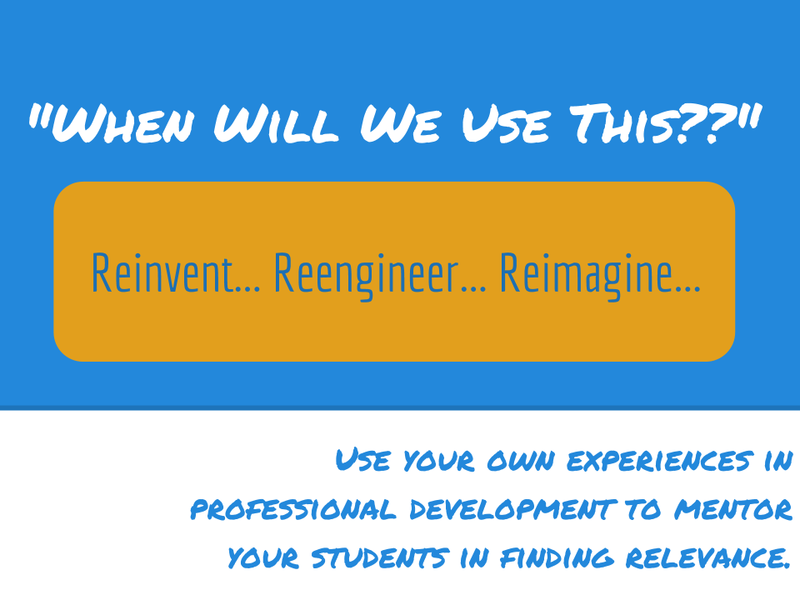 Anytime we learn something new in grad classes, at professional development, or via our PLN on blogs or social media, we must decide, "How will we use this?" The answer may be easily implemented into current practice, adapted to current practice, or we may have to invent a use. Friedman reflects on our past employment behaviors and current employment realities with Harvard Education specialist, +Tony Wagner, and I think the same adaptability we're having to apply ourselves to job searches is what we can use to train innovation in our students. I'm fixated on the last sentence above. 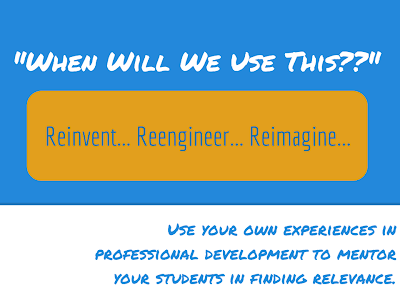 "reinvent, re-engineer, and reimagine that job..." Isn't that what we do with tools and techniques in our classroom? Let's model that! 1. Utilize reverse instruction ("flipping the class") so you can use class time to mentor their investigation and exploration. 2. Stop trying to answer the "when will we use this?" question. "I don't know," is an acceptable answer, and if you take the shame out of it, hopefully you and your students can use it as a door for exploration. 3. Don't be afraid to "mess up" when modeling story problem solutions to the class. (Do it on purpose) Its bad practice to "wing it," but you can recreate the process you went through in finding a solution, and share what things you did wrong before you were "right." 4. We know it will take time; that's probably a reason we avoid these kinds of self-exploration for our students. Be okay with that, plan ahead, and give it time. If we introduce the chapter theme and exploration at the beginning of the unit, and stage checkpoints along the way, students will usually have weeks to discover an application for themselves. What do you think? Is it doable? How do YOU answer this question? Comment below, tweet, and share! Student Blogging - In High School Math?! Foil Wrapper Stylus - Even For Kids? Yes!